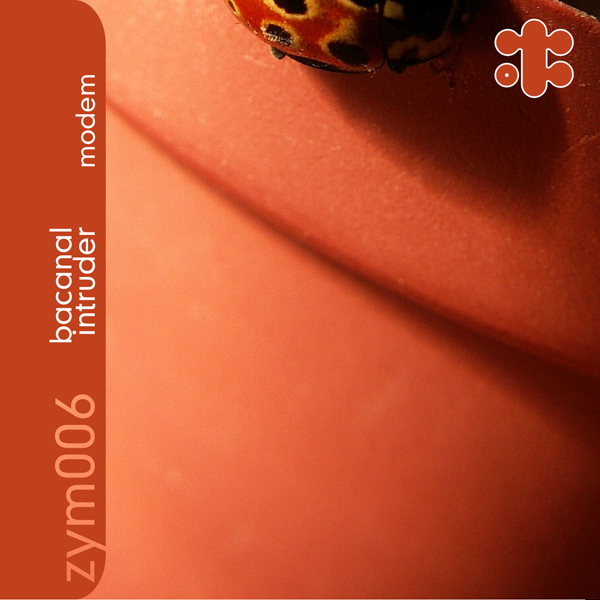 Bacanal Intruder brings zymogen a bit far from its usual habits, but this joyful derailment is definitely a pleasure. A micro-ep with five little tracks and five little melodies sketched with guitars, harmonica, melodica and other strange instruments processed with computer over glitches and digital beats. Luis handles these sounds carefully creating different melodic patterns and, moving from different atmospheres, is able to give you a carefree smile with ironic and beautiful music. A melodica is tickled by microsounds during "Peladilla" to introduce you into this strange world where you'll hear a baby voice singing with you, but suddenly "La Pulga" is there to wake you up with its chaotic melodies and fast random sounds, and then a break; "Lloriao", simply a nice song, nothing more than that, and sometimes it's lovely realizing how simplicity could be beautiful by itself, just a riff, just a melody...it's enough to feel its beauty. Just some minutes and we're already at the end of the ep, yes, but what an end! "Modem Prelude" and "Modem" are something really moving with a stretched guitar and a tender baby voice wich explains you what's the meaning of tenderness in 3 minutes: keep attention! 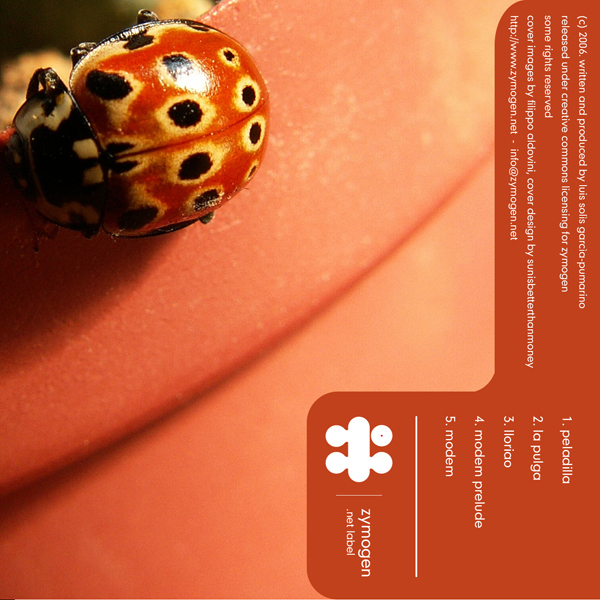 The netlabel Zymogen appears to be, for the most part, abstract and experimental electronica. That’s why this melodic charmer of a EP by Bacanal Intruder is so surprising. Guitar, melodia, children voices and so many other things meander with the electronica to create a fun trip down the rabbit hole. No abstracts here, just pleasant melodies with a little blips and bleeps to make your day. “Modem” is my favorite track. It might be described as a electronic lullaby. This is another EP who’s only fault is that, at just under 15 minutes, it is way too brief. I was very happy when I learned that Bacanal Intruder were releasing a new record. Bacanal Intruder is one of the most unique artist today, he combines complexity and simplicity in a very joyful way, and also manages to create a very genuine sound identity, really characteristic of him. His child-like uplifting / busy music is a blessing, as he creates some very unique mood, full of energy and peace. Modem is likely my fav album of him so far, production wise is brilliant and the structures and progressions here are incredibly beautiful and dynamic. This is a great record that is very accesible and joyful but was built in a very intrincate and powerful way..
Luis Solís no para quieto. A su ya larga lista de ediciones en todo tipo de formato y soporte, añade este nuevo ep de cinco cortes para el net label italiano Zymogen. Tras el exquisito cd-r del pasado año para Eglantine y un primer álbum 'real' que debe aparecer antes de que acabe el año, buenas son estas canciones. El ep se centra en una especie de mundo imaginario de sonido saltarín, melodías juguetonas y instrumentos acústicos procesados: toy folk. A un primer tramo más alocado (Mouse on Mars de verbena en 'Peladilla' y 'Pulga') le sigue 'Lloria', preciosa superposición de motivos melódicos y canción del disco, para después cerrar con los dos corte titulares, decididamente contemplativos. Preciso en la progresión y el acabado. Far from any traditional standards and reduced category, Bacanal Intruder awakes us to hidden curious good feelings and he plays with it. Such as a conjurer, Luis is a child able to place in levitation some infinite melody drops that are necessary for you to assemble and combine with your own way on perception of music and the result is this "Modem ep", all made of fresh air, jumping "pulgas" and catchy "pedalillas" ... "modem" is a good and warm remedy for the slow inertia of things and that is a good reason to thank Zymogen, "grazie" for this nice gift. Very adolesence like; toy boxes with micro edgyness. Reminds me of the tomlab releases such as FSBlumm, Jon Sheffield and others.. Nice work!.